As I was moseying through Pinterest yesterday, I found a card I liked and decided to create a card for my sister Lorraine. It happens to be a "step" card and is EASY to make. WooHoo!! Since Lagoon is one of my very favorite color, using the colors from the #186 Color My Heart Color Dare challenge made sense to me. This week the colors are Gypsy, Lagoon and White Daisy. Perfect! 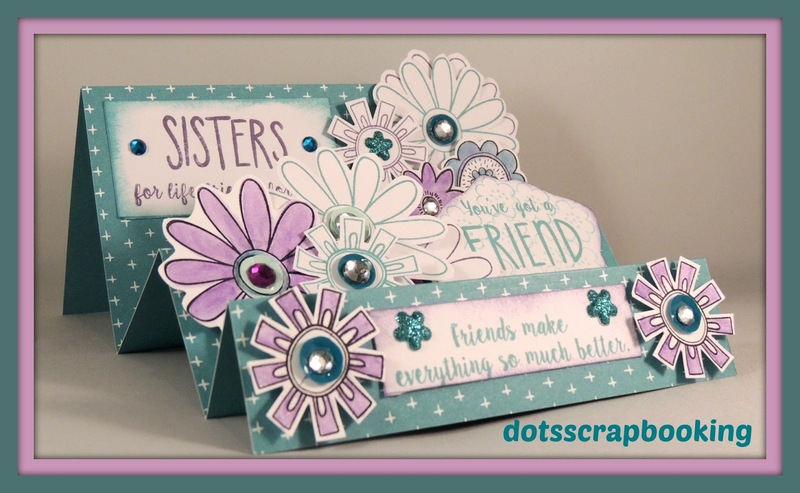 It just so happens that Close To My Heart has a stamp set called "Friend In Me" which is perfect for Lorraine. The set is cheery, springy and just sweet so off I go to create something just for her that speaks to our relationship. Of course, she is my sister but this could also be used for a friendship card for those friends that are so special, they feel like your sisters. So, without further ado, here is my card for Lorraine that I can't wait to send to her-from Texas to New York with Love! The step card was cut from Lagoon Paper Fundamentals at 5 1/4 x 12 with scores made at 1 1/4, 2 1/2, 4 1/4, 6, 9. Embellishments were from my stash but many beautiful shiny things can be found on my website-just click "embellishments"
Watercolor Pencils 3505 which are unfortunately temporarily out of stock. But stay tuned they will be back soon! Wow, what an amazing card. I never made a step card, but I see one in my future. It looks awesome. They are too easy and fun! Thank you!! You out did yourself on this Dorothy! Love it. Thanks Jen!The stamp set spoke to me!! What a fabulous card! I love all the layers of flowers. Thank you for inspiring us at Color My Heart Challenge Blog. Beautiful step card, and love all the flowers layered on each step, and of course the colors you used throughout. Thanks for joining us again on Color Dare, and hope to see you next week with another great color challenge. Love the card and all those layers! What a beautiful step card! Love how you spread the flowers and sentiments throughout the card. Thanks for joining us at Color My Heart. Very pretty. I am getting this stamp set this week. Can't wait to use it! My GOODNESS Dorothy - I just love your card everything about it!! This magnificent card is truly a work of art!--and a labor of love! Thanks for inspiring us with this card at the Color Dare blog! 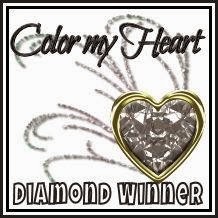 Thank Color My Heart Color Dare for the Diamond award. I am honored!